Hye Tech Auto is is dedicated to taking care of their friends and neighbors in the Covina community when it comes to car repair and maintenance. That's why they are proud to offer a variety of services free of charge to ensure that your car continues to run great for years and years. They understand a safe and reliable vehicle is key to your day to day activities! Come by Hye Tech Auto for any of the following. Properly inflated tires and tires with good tread and no damage are necessary for a safe commute. Balding tires prevent your car from achieving proper traction, which can leave you sliding all over the road. Tires that are incorrectly inflated may also cause you to be unable to properly control your tires. Come into Hye Tech and the technicians will give your car or truck's tires a solid once over to ensure that they are going to be able to provide you with a safe connection to the road. Your vehicle uses a variety of fluids to operate various systems. If these fluids begin to leak or become contaminated it can cause serious issues for your car. At Hye Tech Auto the team would be happy to look over your fluids. We can perform a brake fluid check, cooling system fluid check, power steering check, oil check or transmission fluid check on any year, make or model. The check engine light can come on for a large variety of problems, but most of them are pretty small. Should your vehicle's check engine light come on head to Hye Tech and let the mechanics run diagnostics for free. They will let you know what is wrong with your car and give you all your options for repair, along with accurate estimates. Hye Tech Auto is here to serve you! 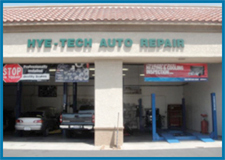 When it comes time for auto maintenance in Covina why go anywhere else? Give our team a call at (626) 332-5452 to request more information about our full service Covina auto repair shop or to make an appointment today.